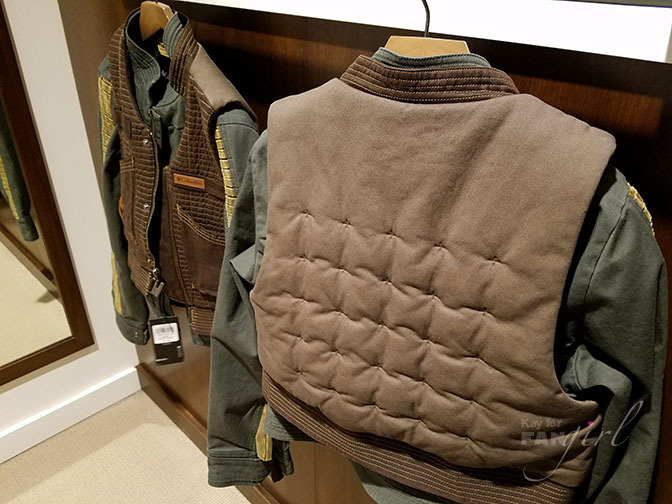 Last month I gave you an early look at the three jackets outdoor apparel company Columbia was releasing to celebrate Rogue One: A Star Wars Story. The limited-run jackets were released online on December 6th as well as in select stores in the US. 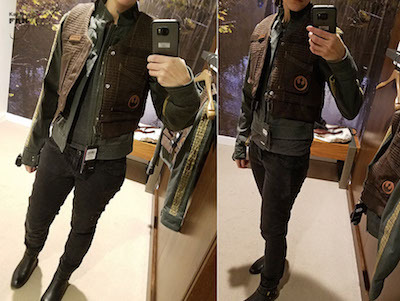 Being in the right place at the right time allowed to me the opportunity to try on the Jyn Erso Rebel Jacket. 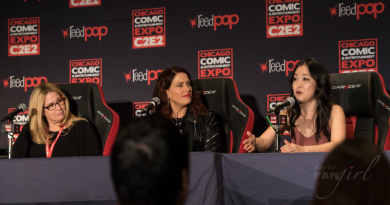 You may have heard me on a few podcasts or read some of my other FANgirl articles where I’ve waxed on about my love of jackets from movies in general. 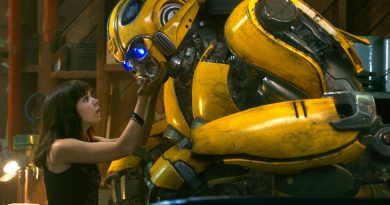 They’re a great way to take a part of a movie you love with you into your everyday life and sometimes they feel downright empowering to wear. 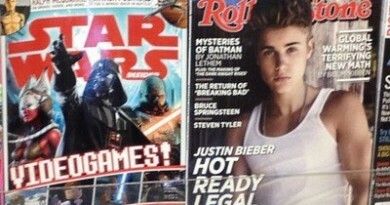 And Star Wars? Star Wars has had some pretty great jackets. So my excitement levels were high (very high) when these Rogue One jackets were first announced. 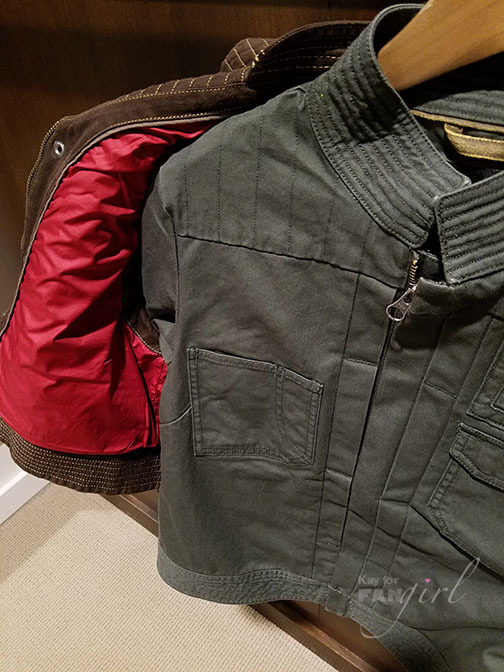 Columbia’s Jyn Erso jacket is actually a jacket with a separate vest you wear over it. It’s nice to get two pieces in one. Plus Columbia has a reputation for quality and functional fabrics. So even though the price is on the steeper end, the cards are stacked to be a high-end product. Sizing: I chose a small to try on based on the measurements available online. The jacket was big enough overall for layering underneath with a good length. Its sleeves were a bit long but not too bad. It was the vest that bothered me the most. It fit like I was borrowing a lifevest intended for someone else. So I tried one size down as well and the fit was more screen-accurate. The thing though is that Jyn wears high-waisted pants in the movie. So the shorter length of the jacket and vest work with that. But since I wasn’t wearing high-waisted pants – it wasn’t the best look and not very practical if you’re wearing the set for warmth. The vest seemed to fit better until I realized the bottom of it still floated away from my mid-section, now feeling like borrowing a child’s lifevest. So it seems I’m between sizes, feeling awkward for different reasons in both sizes I tried. Quality: Both the Jyn jacket and vest are impeccably made. There’s a lot of stitching on these pieces and all of it was nicely done on the two sizes I inspected. I was hoping for more of Columbia’s technical fabrics to be incorporated, but alas there’s no Omni-Heat™ lining or waterproofing like you’ll find in the Cassian Andor parka or the Deathtrooper jacket. 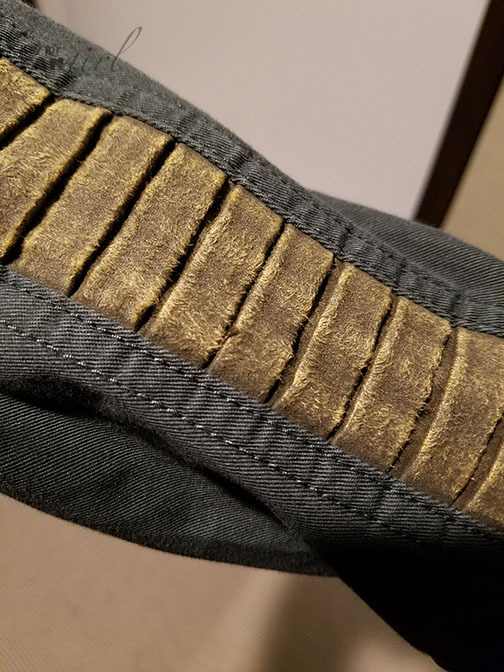 Stretch twill isn’t the fanciest of fabrics, but it looks like the Jyn jacket will wear well and is up for an adventure. A rough, suede-like fabric comprises the striping on the sleeves. The vest is insulated. By touch and while wearing I could only feel insulation for sure in the back. 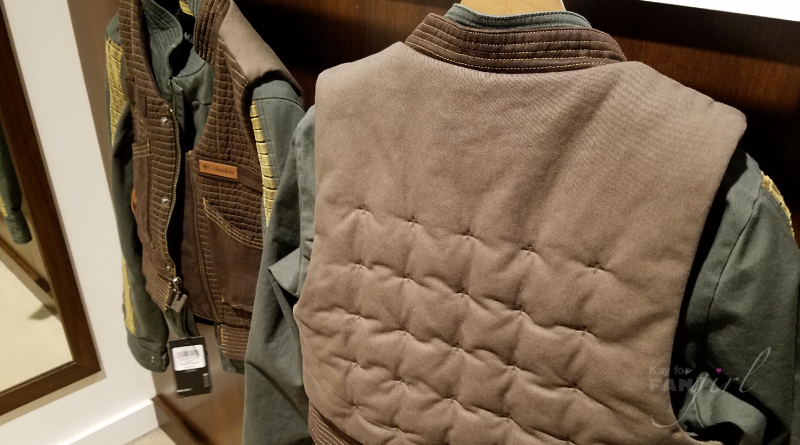 I wasn’t sure if that was because Jyn’s vest is meant to be quilted and puffy in the back, but I conferred with a sales associate who also believed my first impression was the case. Columbia does offer thin insulation though so it’s not impossible it’s throughout. The closure at the bottom of the vest is a solid, sturdy metal. Design: From all the images I’ve seen of Jyn’s costume as well as from watching Rogue One, this jacket and vest is very close to what she wears. 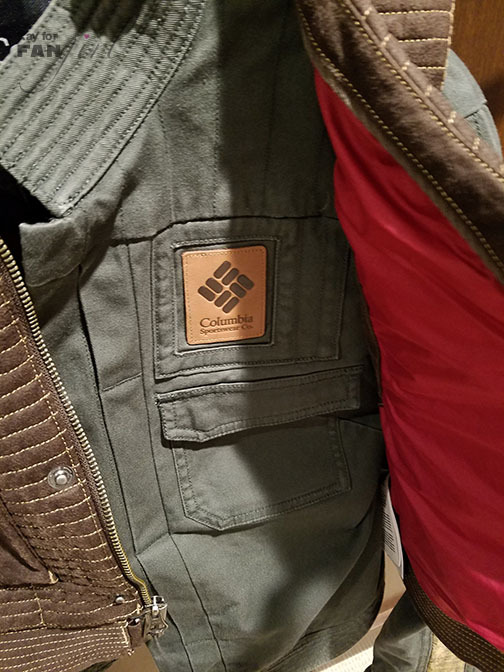 The neckline of the vest is a little higher on the Columbia version. There’s also brand patches and Rebel symbols you won’t find on the movie version and hooks and metal pieces you won’t find on the Columbia version. Practicality: If you live in a place that gets really cold in the winter, this jacket and vest won’t keep you all that warm. 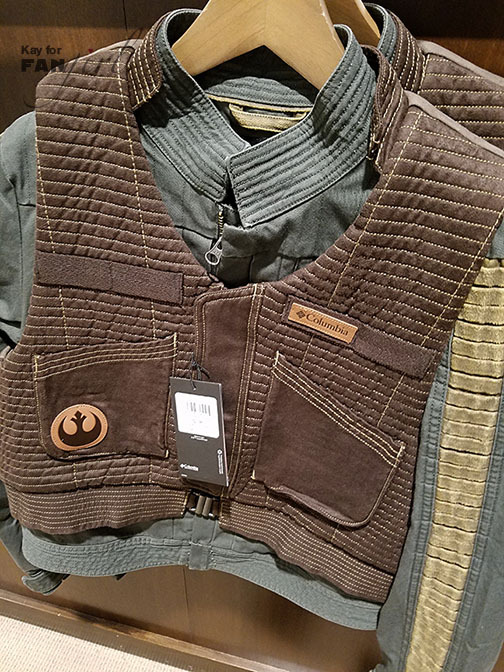 This combo is likely better suited for around 50 – 60° F. Some other jackets may be easier to blend in while walking down the street but this Jyn offering has a distinct look and in most places the vest will be what makes it stand out, which is fine if that’s what you’re looking for. I could definitely see myself incorporating the jacket on its own into my everyday wardrobe. Availability: The Jyn Erso jacket set went on sale along with the two other Columbia Rogue One offerings on Friday, December 9th and was sold out online by the next day. There is said to still be some stock in select official Columbia stores. It would have been nice if something this pricey was easier for more people to try on before buying, but there’s also the limited edition factor at play. Stores that carry the coats have a nice display that makes them easy to locate. One of each size of each jacket available is on display with any additional inventory kept in the back. 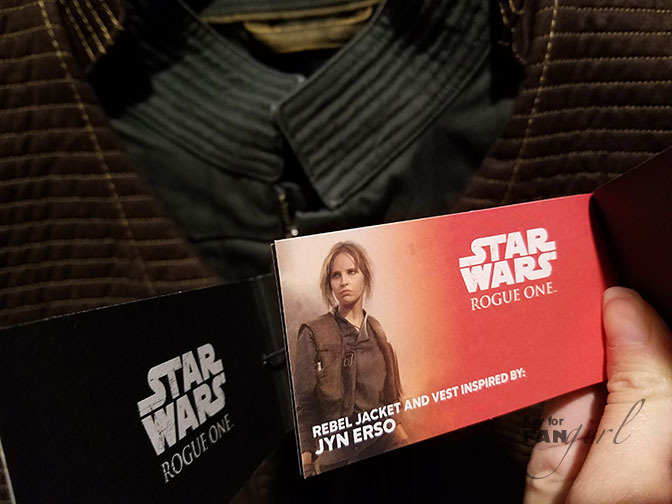 Conclusion: Theoretically the Jyn Erso Rebel Jacket was exactly what I was looking for – getting the opportunity to buy a jacket from a Star Wars movie. The sizing ended up being too much of an issue for me, as in both cases I felt awkward instead of the spectacular I expected to feel. If it was possible to just buy the jacket without the vest, I might have considered that. There’s no denying this Jyn-inspired apparel was thoughtfully designed and well-made though. I hope more Star Wars jackets made like these become available for fans to buy. Please do not repost any of the images from this article without permission.